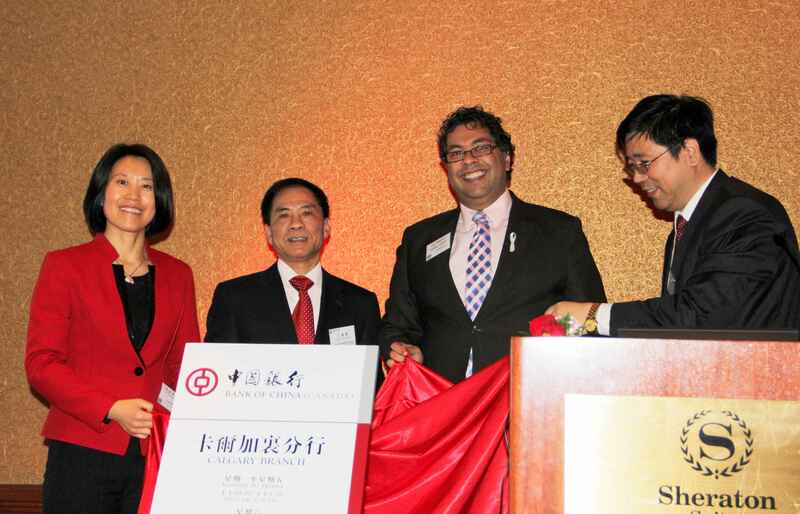 On Dec 6th .2011, Bank of China (BOC) officially opened its Calgary branch. BOC risk management CEO Mr. WANG Jianqiang, BOC Canada General Manager Mr. WANG Lijun, Calgary Mayor Naheed Nenshi, Calgary Economic Development president Mr. Bruce Graham, guests from local energy and financial industries and representatives of Chinese companies presented the opening ceremony. Consul General Mme. LIU Yongfeng presented and addressed on the ceremony. She congratulated Bank of China on opening its first branch in Calgary. Consul General LIU stressed that China-Canada relations stepped forward with vigorous momentum in recent years, especially after Prime Minister Stephen Harper's visit to China in 2009 and President HU Jintao's state visit to Canada in June 2010, the practical cooperation between China and Canada has been deeply strengthened. The Calgary branch of the Bank of China is a result yet proves that the two sides are enjoying the rapidly strengthening economic ties. She hoped that Calgary branch will play a bridging role in promoting the trade and investments between China and Alberta. Consul General LIU was interviewed by OMNI TV after the ceremony. Deputy Consul General WANG Xianmin also presented the ceremony.